I’ve talked a lot on this blog about the problems with memory, but I realized recently I’d never done a post on the topic of group false memory, particularly the Mandela Effect. If you’ve never heard of that, it’s a term that was invented/popularized by this website discussing the phenomena of “…apparently real, alternate memories of a history that doesn’t match the documented history in this reality.” More specifically, these are very vivid memories about pop culture or world events, held by multiple people with no association to each other, that were not true. Now unlike many things I write about here, the interesting part about these is that they are not motivated by anything in particular. No one gains any ego/political/social points by believing them. The phenomena was actually named when the woman who started site realized that she had erroneously believed that Nelson Mandela died in prison rather than in 2013. She thought she was confused, until she later heard a near stranger at a conference mention that they had believed the same thing. Eerily, this was not a “I thought I heard that”, they both had full memories of news and seeing the funeral. The memory that the popular children’s books were titled “The Berestein Bears”. They were not. They were the “Berenstain Bears”. The belief that the color chartreuse is reddish. I specifically listed the three above because those are all memories I have, and I was surprised to find out none of them were real (well, I figured out my Billy Graham memory was wrong in February, but I was surprised to find out I wasn’t the only one who clearly “remembered” this). The chartreuse one particularly surprised me because I remember googling it when “Frozen” came out and Olaf mentions it. Maybe it’s because he says “crimson” right before, but I’m not clear how I looked that up and still remembered it incorrectly. Anyway, there’s not a great theory for why this happens, other than that alternate universes occasionally open up and drop alternate realities on us. Kidding. Sorta. Seriously though, the best suggestion is that around some events there’s enough subtle cues that large numbers of people get them mixed up. Like the for the Berestain Bears, most of us have met people with a last name ending in -stein, so at some point we think it looks more correct. Combine that with the loopy handwriting from the books and the southern twang influenced pronunciation in the TV show theme song, and you’ve got a mass memory of a name that never existed. The other idea is that events or people that are in the news at the same time might get conflated. For example this article points out that when asked to identify former US presidents, many people will say Alexander Hamilton was while missing actual former presidents. However, we know that’s because most people learn about him at the same time they are learning about the founding fathers, so they associate him with that. It’s possible a similar thing happens with events. Did Nelson Mandela make headlines for something else around the same time someone else’s funeral was going on? Maybe! That would be really hard to track back, but it’s plausible. If even 1% of people seeing those headlines conflated them at some point later, that could seem pretty freaky…..especially now that they can gather on the internet. You know, it’s that or we’re all on the hologram deck. Conflating one memory with a similar one strikes me as most likely. In the filing cabinet of the brain, items marked “vivid/important” get stored in many folders, one of which is the “vivid/important” folder itself, where it brushes up against other vivids. Rather like the brain having a #vivid category. With Graham, whatever original mistake your brain made would be reinforced many times by the fact that his son has been prominent without much mentioning the father over the last decade or so. It would silently suggest that Dad is no longer around. I will actually bet anything my memory started with that TV Guide issue. Oho, I can tell you exactly when the Nelson Mandala misunderstanding happened. I was watching a speech by then President Bush and he was talking about the middle east. Among the things he said during a bit about encouraging the Nelson Mandala’s of the middle east was the problem that in the middle east they (they being perhaps the terrorist groups allied with the governments), anyway, They had killed all their Nelson Mandalas. I turned to my husband and said, “Just watch. The press is going to take his metaphor and use it to laugh at President Bush and say, “He’s so stupid. He doesn’t know Nelson Mandala is still alive. Ha ha ha.”” Days went by and I did not see those headlines and I thought, Huh, I guess some reporters do understand a metaphor. It’s possible there’s another reason, but I’m this close to willing to bet on my theory. 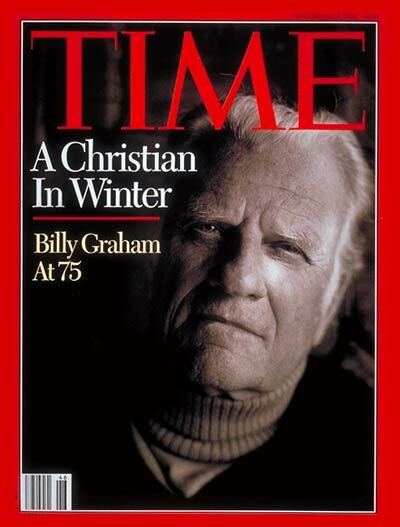 I, too, was surprised by Billy Graham’s death. His Parkinson’s was announced a really long time ago and he was really old at that time. Then I never heard about him again. Somewhere along the line I assumed he had died without having a memory of an announcement, but it only made sense. Interesting! I bet that’s at least part of it. It’s possible the ones that get really big have two or more such incidents that play off each other. I think another reason people might believe Alexander Hamilton was a president is that he appears on the $10 bill. I would wager some people similarly believe that Ben Franklin was a president. Dead Presidents is slang for paper currency. Pretty soon people will believe Harriet Tubman was our first black female president. Good point about money….it might reinforce the error without anyone quite noticing.